It's amazing what you can learn about Salt Lake City by strolling throught the city cemetery. When I first set out to write about the Salt Lake City Cemetery, I contacted Mark Smith, the cemetery's sexton. He sent me a packet full of information, and after reading through it several times, I decided that there is no way I can do the cemetery justice in one article; it had to be a series. This is the first part in that series. Stay tuned for more articles to come on the Salt Lake City Cemetery. It is easy to become fascinated with this place, and I hope I can do it justice and that you will share in my excitement about the many fascinating stories and history to be found in the Salt Lake City Cemetery! 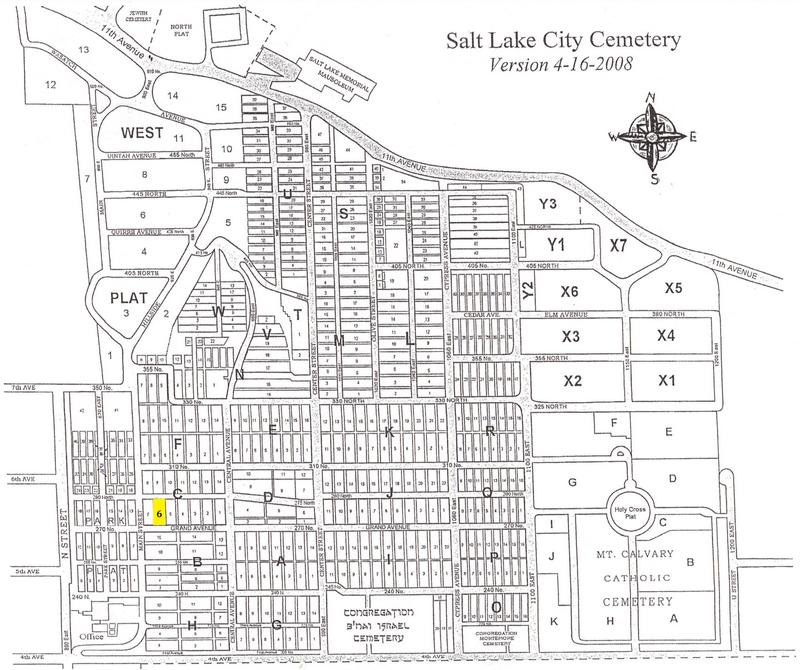 Located in the historic avenues district between "N" and "U" streets, and Fourth Avenue and Wasatch Blvd, the Salt Lake City Cemetery has over 116,000 burial spots, and covers over 250 acres. The current sexton of the cemetery, Mark Smith, says "I think our cemetery is one of the hidden jewels of Salt Lake City and get excited when individuals take an interest in it. I think it is an amazing place!" I completely agree, and know that you will too upon discovering and learning more about this "hidden jewel"! The cemetery is laid out in Plats. A Plat is an area of land that was developed at a specific time. Plats are divided into lots, and each lot contains ten graves. When searching for a grave, you can find the plat letter painted on the curb. The first known burial in the Salt Lake City Cemetery was that of Mary M. Wallace, daughter of George B. and Melissa Wallace. She was born in Indian Winter Quarters on January 8th 1847, and died in Salt Lake City Utah of diarrhea on September 27th 1848. The lot owner where she and her other family members is owned by Daniel S. Wallace, who is a relative of her parents. You can find her grave located in section C, plot 6 (see map below). Her brother, George Jr., died within a month of Mary, and he was only 3 months old. He, too, died of diarrhea. It is so sad to me that something so easily treated now was life threatening for the early pioneers. February 17th, 1849: Brigham Young formed a council to find an acceptable spot for the city cemetery. The council consisted of Daniel H. Wells, Joseph Heywood, and George B. Wallace. Mr. Wallace led the group to an area he had buried his daughter and other family members. The other council members agreed that this spot was suitable, and twenty acres were surveyed. January 1851: The Great Salt Lake City was incorporated. 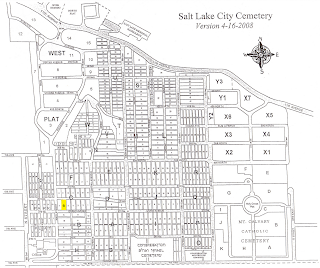 The twenty acres surveyed by the council became the Salt Lake City Cemetery. July 1863: Corner stones are placed to mark plats, and in 1900 Park Plats were opened and perpetual care was started. Perpetual care extended to the whole cemetery in 1906. WHAT IS A SEXTON? A sexton is the person assigned to take charge of, care for, and supervise the cemetery. They are responsible for the open and close of graves, and to do this they must know where each plot is located. In short, if there is anything you want to know about a cemetery, the sexton is the person to go to! They know their cemetery inside and out! Mark Smith is the current sexton of the Salt Lake City Cemetery, and has been since 2002. February 27th 1915: The Gate Entrance design was chosen. (Read more about this below). You can read the Deseret News article here. 1942: Walls were built around the Cemetery by the Work Program Alliance. August 19th 1945: A flash flood came through the cemetery. Read the Deseret News story about this flash flood. (At the top of the page, type in page 4 to see pictures.) On August 19th 1945, a flash flood hit hard in downtown Salt Lake City, especially in the Avenues district. Several caskets were exposed, and several headstones were washed down to 4th Avenue. 1994-1995: The last two areas of the Cemetery, X-5 and X-7, were developed. The original design of the Salt Lake City Cemetery's gate entrance is by Frederick Hust. He entered and won a gate design contest held by the Civic Planning and Art Commission on February 27th, 1915, as announced in the Deseret Evening News. Because they did not look at the designers of the gate, and only the sketches, they only knew that the winner was "No. 12". After announcing that the winning design was No. 12, they then opened the envelope providing the name of Frederick Hust. Mr. Hust was an architect with offices at 518 Felt building. The article announced that he would receive $35 as the winner of the gate design. The Deseret News article states that "The first prize was awarded to Mr. Hust with the understanding that the commission reserves the right to use or to not use his plans, as may later determine." Mr. Hust's plans would have cost $3,500, but the state's budget only allowed $2,000 to build the gate. The city was optimistic that his plans would be able to be scaled down to fit in the state's budget. Mr. Hust consulted with Heber M. Wells and Richard Kletting (architect for Saltair, the Utah State Capitol, and many other grand buildings) on building the gate. There is a lot of controversy as to whether or not his design was actually used. I think it looks quite similar to the original design, just not as wide. In my opinion, his design was used, but you can decide for yourself. Work on the gate began in 1915-1916. Here is a picture of it from September 9th 1917. You'll notice that there are stairs inside the gate, and today there is only sidewalk. The "other side" of the cemetery, including Emo's Grave, and who is Emo? What do YOU want to know about the cemetery? Email me at michelle@enjoyutah.org and I will be glad to research it for you for an upcoming article!